Habituation is a reduction in a previously-displayed response when no reward or punishment follows. If you make an unusual sound in the presence of the family dog, it will respond — usually by turning its head toward the sound. If the stimulus is given repeatedly and nothing either pleasant or unpleasant happens to the dog, it will soon cease to respond. and is long-lasting; when fully habituated, the dog will not respond to the stimulus even though weeks or months have elapsed since it was last presented. Sensitization is an increase in the response to an innocuous stimulus when that stimulus occurs after a punishing stimulus. When the siphon of the sea slug Aplysia is gently touched, the animal withdraws its gill for a brief period. However, if preceded by an electrical shock to its tail, the same gentle touch to the siphon will elicit a longer period of withdrawal. The sensitization response to a single shock (blue bar) dies out after about an hour, and returns to baseline after a day (yellow). So it is an example of short-term memory. is retained longer (tan and gray bars). For more on sensitization in Aplysia, including the neuronal circuits involved and the mechanism of both the short-term and long-term response, follow this LINK. If newly-hatched geese are exposed to a moving object of reasonable size and emitting reasonable sounds, they will begin to follow it just as they would normally follow their mother. The time of exposure is quite critical. A few days after hatching, imprinting no longer occurs. Prior to this time, though, the results can be quite remarkable. A gosling imprinted to a moving box or clucking person will try to follow this object for the rest of its life. In fact, when the gosling reaches sexual maturity, it will make the imprinted object — rather than a member of its own species — the goal of its sexual drive. Male mice become imprinted with the odor of littermates during the first three weeks of life. When they reach sexual maturity, they avoid mating with close relatives. The odor is controlled by the major histocompatibility complex (MHC). The conditioned response is probably the simplest form of learned behavior. It is a response that — as a result of experience — comes to be caused by a stimulus different from the one that originally triggered it. The Russian physiologist Ivan Pavlov found that placing meat powder in a dog's mouth would cause it to salivate. The meat powder, an unconditioned stimulus (US), triggers a simple inborn reflex involving taste receptors, sensory neurons, networks of interneurons in the brain, and autonomic motor neurons running to the salivary glands — producing an unconditioned response (UR). 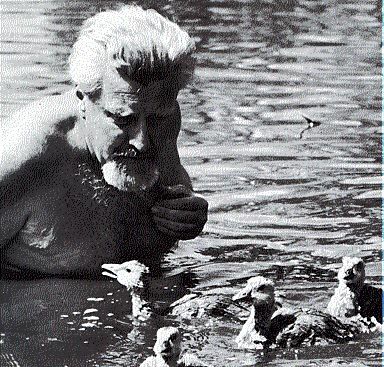 Pavlov found that if he rang a bell every time he put the meat powder in the dog's mouth, the dog eventually salivated upon hearing the bell alone. This is the conditioned response (CR). The dog has learned to respond to a substitute stimulus, the conditioned stimulus (CS). We assume that the physiological basis of the conditioned response is the transfer, by appropriate neurons, of nervous activity in the auditory areas of the brain to the motor neurons controlling salivation. This involves the development and/or strengthening of neural circuits, which — we may also assume — is characteristic of all forms of learning. Link to a discussion of the neural changes in long-term potentiation (LTP), another form of learning. The conditioned response has proved to be an excellent tool for determining the sensory capabilities of other animals. For example, honeybees can be conditioned to seek food on a piece of blue cardboard [View]. By offering other colors to a blue-conditioned bee, Karl von Frisch (who shared the 1973 Nobel Prize with Lorenz) found that honeybees can discriminate between yellow-green, blue-green, blue-violet, and ultraviolet. Pavlov's dogs were restrained and the response being conditioned (salivation) was innate. 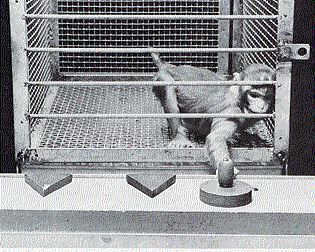 But the principles of conditioning can also be used to train animals to perform tasks that are not innate. In these cases, the animal is placed in a setting where it can move about and engage in different activities. The experimenter chooses to reward only one, e.g., turning to the left. By first rewarding (e.g., with a pellet of food) even the slightest movement to the left and then only more complete turns, a skilled experimenter can — in about 2 minutes — train a naive pigeon to make a complete turn. A little more work and the pigeon will pace out a figure eight. Such training is known as instrumental conditioning or operant conditioning. The latter term was coined by B. F. Skinner, whose skill with the technique enabled him to train pigeons to play ping-pong and even a toy piano! It is also called trial-and-error learning because the animal is free to try various responses before finding the one that is rewarded. Maze problems are a form of instrumental conditioning in which the animal is faced with a sequence of alternatives. 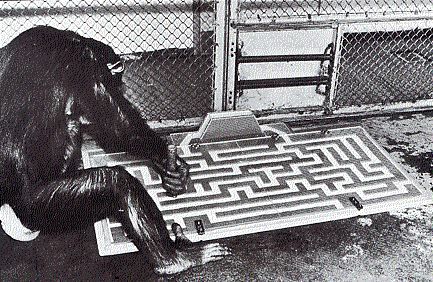 In this photo (Courtesy of B. Rensch), Julia, a chimpanzee, uses a magnet to move an iron ring through a maze. Julia is able to solve mazes like this on her first attempt most (86%) of the time and sometimes faster than biology students can! Although most animals solve mazes and other problems by trial and error, Julia (and biology students) usually make only one or two random attempts at solving a problem and then, all of a sudden, "get it". They have made an abstract generalization about the specific problem; that is, have formed a concept. In monkeys (and probably humans as well), concept formation depends on activity in the prefrontal cortex of the brain [View]. Recent research suggests that honeybees can also solve simple oddity problems!